When Melanie Fu heard that an event exploring the power of storytelling to create awareness and behavior change in global health was in the works, she knew she wanted to be part of it. 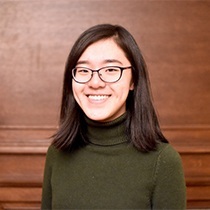 Now in her junior year at Harvard College, Melanie is double majoring in neural biology and social anthropology. She came to the East Coast from her hometown—Sacramento, California—because she was attracted to the atmosphere at Harvard. The campus and the community were different from anything she had experienced before. As co-president of the Harvard Undergraduate Global Health Forum (HUGHF) and a member of Speak Out Loud, Melanie was excited to bring together two of her passions—global health and storytelling. The event, Effective Storytelling: Igniting Global Health Change, included a discussion session between panelists and the audience moderated by Melanie. It was hosted by Harvard University’s Defeating Malaria: From the Genes to the Globe initiative and featured four panelists with backgrounds in film, music, and global health topics. Speakers talked about ways to spread awareness about global health through various storytelling mediums. Another new experience for Melanie was joining Harvard’s spoken word club, Speak Out Loud. She had watched spoken word videos on YouTube growing up, but she had never performed poetry for an audience. She feels lucky that the supportive Speak Out Loud community has given her the opportunity to learn about writing as a way of expression. As part of this club, she has learned about telling stories that draw people in by evoking emotion. Although her global health passion and arts passion seem to be different areas of Melanie’s life, she is confident that their intersection is important. She believes that global health is a field “that has kind of historically been about voices and whose voices are heard and whose are represented and whose aren’t heard. I’m really drawn to that because I feel like by diversifying the people who are telling stories, we can tell better, more powerful stories.” As a staff photographer for The Harvard Crimson, Melanie has also learned to balance the desire to tell a story with the need to respect the person the story is about. Melanie happens to be the only student in both HUGHF and Speak Out Loud, but she encourages others to follow suit. For anyone interested in both the arts and health, Melanie recommends exploring the many opportunities that Harvard offers and beginning to make content in any way possible. She would like to see Harvard’s global health scene become more interdisciplinary; one of her ideas is to think about global health through different lenses. Harvard’s Defeating Malaria initiative is creating additional programs to engage students like Melanie. Stay tuned for more collaborative efforts.